The Native American story of the Sioux War. Learn about the culture, stories, and legends of American Indians and their famous chiefs, tribes and wars. A Native American Story of the Sioux War to teach kids about Native Indians in a short, enjoyable, easy to read format. The Sioux of the Standing Rock and Cheyenne River Agencies, occurred in the winter of 1890-91, involving upwards of one hundred thousand Indians and representing the sixteen great tribes of the North-west, chief among which were the Brules, Ogallalas, and Uncapapas. Led by Big Foot and Sitting Bull, this uprising threatened to be the most stupendous in the history of Indian warfare; but, fortunately, the killing of Sitting Bull and the speedy and masterful concentration of troops under the direction of General Nelson A. Miles demoralized the conspirators, who were awed by the terrible slaughter inflicted on the Indians by the Seventh Cavalry at Wounded Knee, December 29, 1890. This prediction of the second coming of Christ was founded on the philosophy of the Christian religion and originated about 1888 among the Paviotso in Nevada. 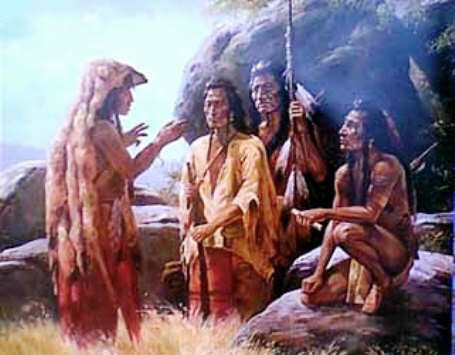 Its prophet was a young Paiute Indian, by name Jack Wilson, who announced that he had received a direct revelation from the God of the Indians. He proclaimed that a new dispensation was to occur; that the Indians were to be restored to their inheritance and to be reunited with their departed friends, whom, at the appointed time, the prophet was to restore to life. The plains were again to teem with vast herds of wild horses; the buffalo was again to return and roam the country as in the days of old—indeed, the earth was to become an Indian paradise in which the red man was to reign supreme. These deluded people were told that they must prepare for the coming of the Messiah by practising songs and dance ceremonies, which consisted of a ceremonial religious dance, commonly known as the spirit, or ghost, dance, in which "the dancers, men and women together, held hands and moved slowly around in a circle, facing towards the centre, keeping time to songs that were sung without any instrumental accompaniment. Hypnotic trances were a common feature of the dance." During this excitement a large body of troops under General Brook had arrived at Pine Ridge; this caused terror to spread among the Indians on the reservation, and, becoming frightened and desperate, about eighteen hundred of them left their homes and fled to the Bad Lands. It was Sitting Bull's intention to join this body of disaffected Indians. Big Foot's band of Minneconjoux Sioux had already fled from their Agency on the Missouri River and were making for the camp of hostiles in the Bad Lands. It was, therefore, of the greatest importance to prevent Sitting Bull from escaping and putting himself at the head of these desperate and frightened red men, for his presence in the camp of the hostiles would inevitably result in a most disastrous war—the most stupendous of all Indian wars in history. At this juncture of affairs General Miles arrived at the Pine Ridge Agency and at once undertook energetic measures to stamp out the rebellion, assembling a force of nearly three thousand troops, which slowly drew a ring of iron about the hostile camp. The Indians were prevented from scattering into small bands, and eventually the troops occupied positions between the Indians and their stronghold in the Bad Lands. The steady advance in force of the troops overawed the Indians, and, although the fierce Brulés were still in a hostile mood, the main body of the Indians drew nearer and nearer to the Agency, until finally some of the chiefs of the Ogallalas came in for a conference with General Miles. Young-Man-Afraid-of-His-Horses, one of the most powerful of the Sioux chiefs, and friendly to the whites, influenced the Ogallalas to desert the hostile camp, with the result that this band was shortly encamped with their friends of the same tribe who were on the south side of the Agency. The Brulés still maintained their defiance, moving, however, still closer to the Agency. The troops meanwhile continued their show of force without making any actual attack, intending merely to overawe this fierce band. General Miles had sent word among them, assuring them of a strict compliance with the terms of their treaty and that their grievances would be redressed if they would quietly surrender. The efforts of General Miles finally met with success, and the large camp of hostiles returned to the Agency and promised to keep the peace for the future, realizing that they could no longer contend against the organized military power of the United States. At Wounded Knee they had learned that treachery was swiftly punished and that the representatives of the governmental authority must be obeyed. 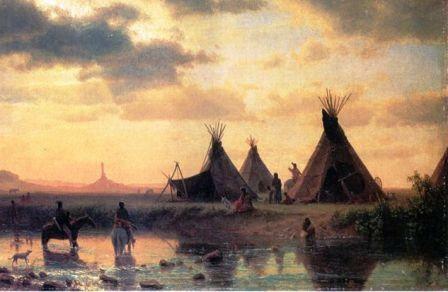 At this time there were about ten thousand Indians camped about and around Pine Ridge. A demand was made for the Brulés to surrender their arms, but only a few of them volunteered to give up their weapons, and considering the large number of Indians and the possible outcome if they resisted, it was considered best not to enforce this order. The Indians were soon sent back to their different agencies. The Brulés returned to their own reservation at Rosebud. As a guarantee of their future good behavior and to prevent the possibility of any further conspiracies, thirty of the leaders responsible for the uprising were gathered together and sent to Fort Sheridan, near Chicago, and included in this body were Kicking Bear and Short Bull, the two men who had the year before crossed the mountains to meet the Messiah in Nevada. Some time later it was thought desirable to remove others of the malcontents among the Brulés, so a number of the most dangerous members of the tribe were turned over to Colonel Cody, who employed them in exhibitions in his Wild West show. "There were many stirring and grandly picturesque scenes at Pine Ridge during the closing days of the late campaign against the ghost-dancing Sioux, but the one of most absorbing interest was the final review by General Miles of the thirty-five hundred soldiers, who had marched through sand-storms and blizzards in order to complete the cordon of bayonets that was to slowly drive the savages to unconditional surrender. The night before the review, haranguers, with little medicine-bags tied about their strange garments, went through the villages of the hostile and sullen Brulés and the peaceable Ogallalas, telling their people of the military demonstration which was to take place in the morning. "When the sun came up the ridges skirting the Agency to the east and west were fringed with Indians, who looked like Arab sheiks in their white sheets and hooded heads. Not a squaw was to be seen among all those ghostly figures, so distinctly outlined against the horizon. Statuesque and haughty, the warriors stood watching the flying columns of cavalrymen and the explosive efforts of the cannoneers as they urged their animals into line. Down in the same valley, where the troops were hurriedly preparing for their manœuvres, but nearly a mile away to the north, were the great Indian villages, with the squaws corralling their thousands of ponies, as a precautionary measure against any possible hostile demonstration on the part of the army. "The column was almost pathetically grand, with its bullet-pierced gun-carriages, its tattered guidons, and its long lines of troopers and foot-soldiers facing a storm that was almost unbearable. It was the grandest demonstration by the army ever seen in the West; and when the soldiers had gone to their tents the sullen and suspicious Brulés were still standing like statues on the crests of the hills." The Native American Indian Story of the Sioux War provides an opportunity to read about the life and times of Native American Indians and many of their great wars, chiefs and famous leaders. A Classic Short story about Sioux War for kids and children of all ages. This short story of the Sioux War is great to read to kids and children enabling them to learn about history in a fun way. This very short story contains information about the famous chiefs of Native Indian tribes and their wars, battles and conflicts. This short Native American story has been selected to keep the attention of kids and children of all ages. Read our free short story online about Sioux War. This free, online short story about the people of famous tribes Native American Indians to increase knowledge and understanding of the indigenous people of North America and the wars and battles they fought. The Story of the Sioux War. Discover the vast selection of pictures which relate to the Stories, History and Culture of Native Americans. The pictures show the clothing, War Paint, weapons and decorations of various Native Indian tribes that can be used as a really useful educational history resource for kids and children of all ages. We have included pictures and videos to accompany the main topic of this section - The Native American story of the Sioux War. The videos on this website enable fast access to the images, paintings and pictures together with information and many historical facts. All of the articles and pages can be accessed via the Native Indian Tribes Index - a great educational resource for kids.